Commanding Officer of Fleet Combat Direction Systems Support Activity, San Diego. Led combined work force of 155 military, 215 civil service employees and 300 contractor personnel in the design, construction, test and delivery of combat direction systems for aircraft carriers and amphibious ships; command, control, and communications programs; and airborne tactical data systems.Managed annual operating budget of $9 Million. Navy’s major west coast software development activity. Total budget of $31 million. Directed development efforts leading to successful, on-time development and delivery of two major tactical computer programs which had been behind schedule and in danger of missing deadlines. Instilled sense of teamwork among civil service and contractor personnel. Enhanced communications and working relationships with supporting activities. Commanding Officer of Naval Station, San Diego, Navy’s largest shore installation and logistics support facility, supporting 115 ships and 49 tenant commands. Directed facilities management, new construction, tug and pilot services for San Diego harbor, recreation facilities and services, living and dining facilities, family support services, police and security, and prison facilities. Directed staff of 900 military and 1,025 civil service personnel. Managed annual operating budget of $31 million. Won Presidential Award for best shore installation in the Navy, recognizing excellence achieved in increased productivity, effectiveness, cost savings and innovative management techniques. Received Secretary of the Navy awards for best enlisted and senior enlisted clubs in the Navy. Chaired Navy Task Force for review of Navy club system. Recommendations led to major restructuring of club system to improve business structure and profitability. Initiated waste re-cycling program which generated over $1.5 million in sales. Directed initiatives which exceeded goals for energy conservation, reducing consumption in electric power, steam and gas by 12%, 6% and 5% respectively. Initiated major improvements to recreation and physical fitness facilities, generated sales of over $20 million and net profit of $2 million, a 127% increase in net profit. Initiated family home day care program in San Diego military housing, now Navy’s largest with 147 licensed homes. Special Assistant to the Chief of Naval Personnel. Principal advisor and representative in all matters relating to the management, assignment and distribution of navy’s top senior executives (flag officers). Direct interface with Chief of Naval Operations and Office of the Secretary of the Navy. Prepared legislative proposals which resulted in congressional authorization for critically needed senior flag positions. Developed transition policy to comply with new personnel laws, maintaining promotion opportunity and continuity in senior Navy management. Assistant Chief of Staff for Operations for Cruiser Destroyer Group Commander. Principal planning and operating officer on major sea-going staff. Organized and directed the planning and execution of daily operations of combatant ships deployed to the Western Pacific, including combined exercises with foreign navies.Chaired Special Action Group on anti-submarine operation in the Indian Ocean. Head, Officer Strength Plans Section in Navy Manpower, Personnel and Training Division. Prepared plans to support Navy’s officer manpower budget including acquisition, promotion, retirement, and continuation programs and associated budgets. Institutionalized program to use reserve medical officers on active duty to alleviate critical medical manning shortages. Coordinated strong defense of compensation and quality of life issues in Navy’s budget submission.Provided briefings to and responded to questions from OSD and Congressional staffs.Initiated development of computer-aided tracking of officer retention.Budget deadlines met with error-free results. Scheduling officer, coordinating daily operations and deployments of over 100 ships assigned to Navy’s Third Fleet. Coordinated quarterly scheduling conferences. Developed program to increase submarine transit training. Resulted in 50% increase in training opportunity. Student at Air Force War College. Completed course of study and obtained M.B.A. degree during off-duty hours. Commanding Officer of guided missile destroyer, USS WADDELL (DDG-24). Responsible for ship’s operations, material readiness, training, crew safety and morale and combat readiness. Assigned to command three years ahead of contemporaries. Received awards for excellence in operations, engineering, gunnery and anti-submarine warfare. First ship of class to pass rigorous operational propulsion examination. Consistently among leaders in personnel retention. 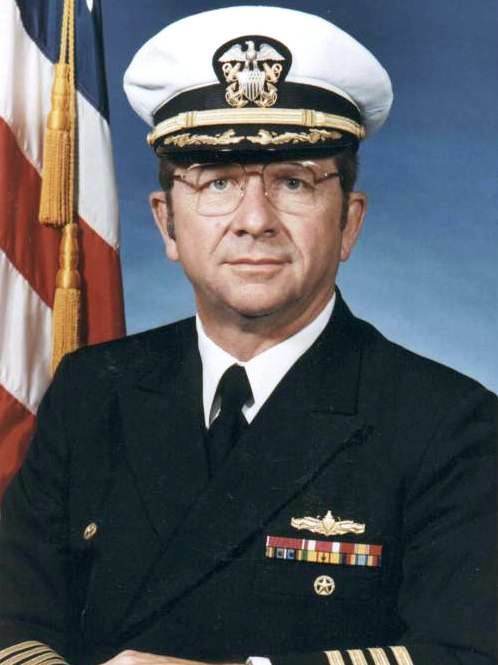 Commanding Officer of Navy Frigate, USS BRONSTEIN (FF-1037). Responsible for ship’s operations, material readiness, training, crew safety and morale and combat readiness. Directed highly successful shipyard overhaul, completing on schedule and within budget. Successfully completed all post-overhauled inspections and training evolutions in preparation for extended deployment in the Western Pacific.